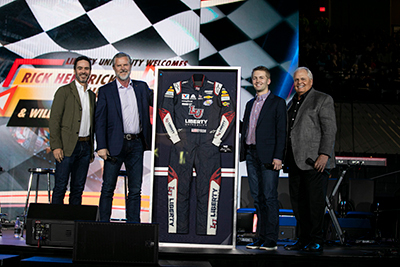 Liberty University’s basketball court inside the Vines Center was transformed into the “Liberty Convocation Motor Speedway” on Wednesday as the university welcomed some leading names in NASCAR. 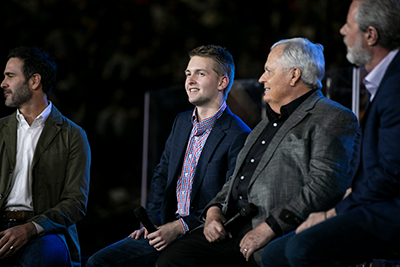 After a panel discussion on the stage with NASCAR legend Jimmie Johnson, 2018 NASCAR Rookie of the Year William Byron, and Rick Hendrick, owner of Hendrick Motorsports, the guests joined Liberty President Jerry Falwell and his wife, Becki, Liberty Football Head Coach Hugh Freeze, and Senior Vice President for Spiritual Development David Nasser, in a good-natured race with mini go-karts. 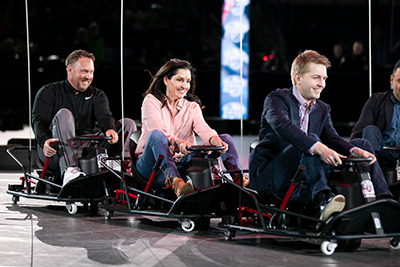 President Falwell got a jump start on the competition in the final race and held off Johnson for the championship. Byron, a junior at Liberty, and Johnson, a seven-time NASCAR Cup Series champion, visited Liberty ahead of their next race on Saturday at 7:30 p.m. EST at Richmond Raceway. During the Q&A, President Falwell asked Johnson what advice he had for students gearing up to start their careers. Byron was asked how he is able to juggle responsibilities and balance the demands of driving at the highest level of NASCAR while maintaining a 3.2 GPA in pursuit of a business communications degree through Liberty’s online program. Hendrick said his faith, family, and friends helped him and his wife, Linda, get through a tremendous trial on Oct. 24, 2004, when their son, Ricky, and Hendrick’s brother, John, who was president of Hendrick Motorsports at the time, and two nieces died in a plane crash in Stuart, Va., as they traveled to a race at Martinsville Speedway. Hendrick also spoke about Liberty’s automotive dealership management program through Liberty’s School of Business, which he helped to start in 2017. The program is giving students and graduates more career opportunities in the industry. The Charlotte, N.C.-based Hendrick Automotive Group currently has 12 Liberty student interns working for the company. He said he has noticed a difference in graduates of Liberty from those of other schools. 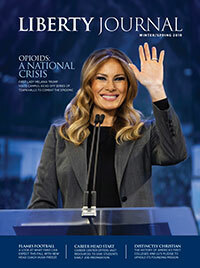 Hendrick applauded the university’s LU Send Now initiative for sending emergency response teams to provide aid and assistance in the wake of disasters across the country and around the world. “If you’re a giving company and you believe in loving and taking care of each other, it makes it fun to go to work,” he said. Hendrick Automotive fed 60,000 people throughout the communities where its dealerships are located during Easter and Thanksgiving last year. Their goal this year is to feed 100,000.